How do I send a private message on Google+? There are two ways to send a private message to someone. The share box that pops-up will look similar to the share box on your stream. But it will only include that person in the message. You can plus other individuals and circles in the same post if you want. If you don't see the Send Message option in their profile, they probably have not enabled it in their profile (instructions for enabling this option). Try the second option if you want to send them a private message. You can add others to a post by typing in + followed by the first few characters of their name. If they are in your circles, you'll see their profile in the drop-down and you can click on it to add them to the post. 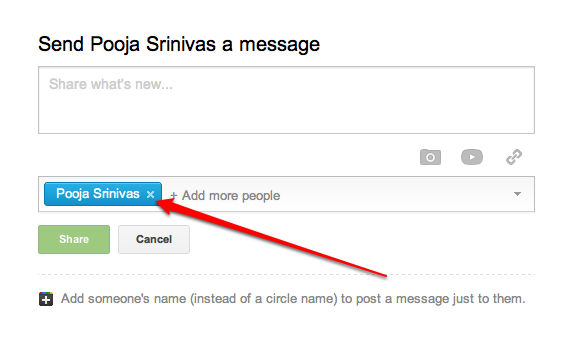 If they are not in your circles or not on Google+, you can add them using their email address. Use the same format of typing in the + followed by the email address. You can add more than one person to the same post by following the steps above. If you are posting to the same set of people again and again, create a circle for them. If it's a private post, don't forget to remove any existing chips/circles before sharing the post. Sent the post to the wrong person or made a typo in your post? Check this link for info on how to delete posts and edit posts.